Low-Sugar and Gluten-Free Slow Cooker Peach Crisp is delicious, and this is perfect when it’s peach season but too hot to use the oven! Click here to see The Best Slow Cooker Summer Desserts with Fruit! Out of all the fruits that show up in the summer, my favorite is definitely peaches, and this Slow Cooker Low-Sugar Gluten-Free Peach Crisp from Kalyn’s Kitchen is a delicious reduced-sugar dessert that disappeared quickly at my house. The recipe uses just a little of the sweetener of your choice combined with a tiny bit of brown sugar to bump up the natural sweetness of the peaches, and the crisp topping is also gluten free. This is great with a dollop of fat-free Greek yogurt, but if you don’t care about the whole low-sugar thing, top it with a scoop of vanilla ice cream! For serving: Fat-free Greek yogurt, whipped cream, or ice cream as desired. 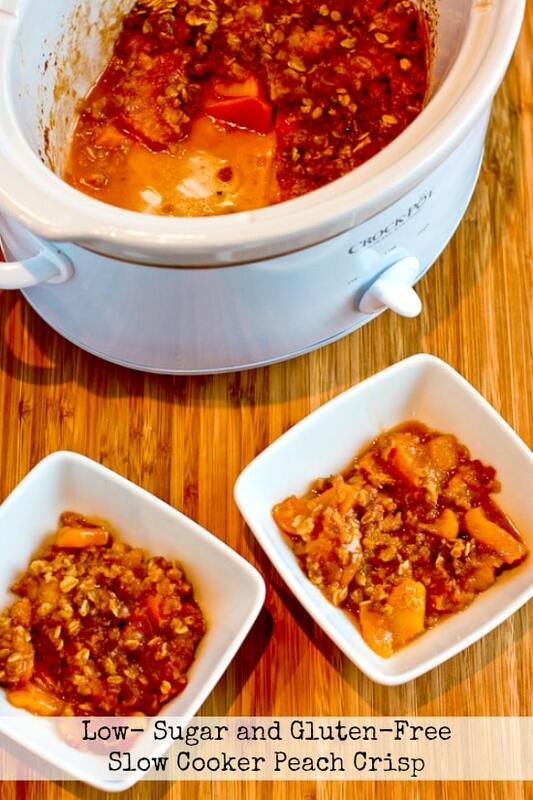 Get the complete recipe for Low-Sugar and Gluten-Free Slow Cooker Peach Crisp from Kalyn’s Kitchen. Use the Recipe-by-Photo Index Page for Fruit to see all the slow cooker or pressure cooker fruit recipes that have been featured on this site.